Looks like an iguanodon is not the only dinosaur to make it back from the late Cretaceous period at Disney’s Animal Kingdom. 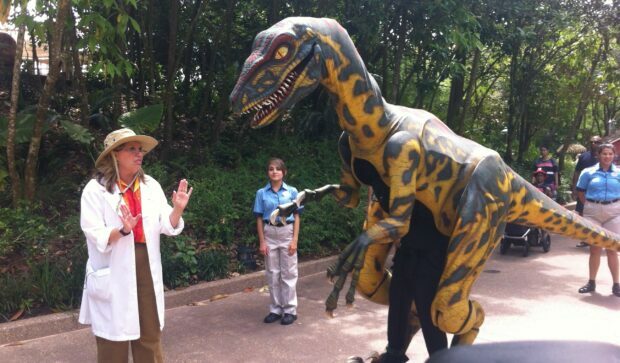 During a test run through approximately May 3, a special character experience is happening in Dinoland USA. 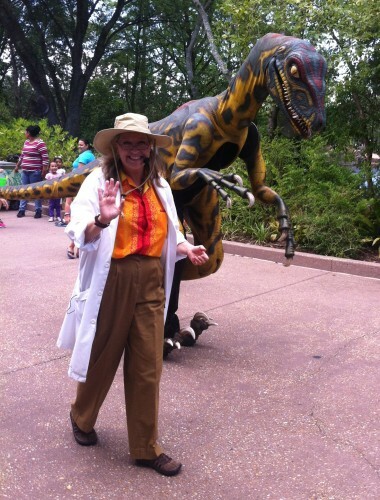 Professor Parker Woodson and her pet velociraptor “Val” are roaming the streets, touring the area and meeting guests. According to Professor Woodson, she has raised “Val” since birth. 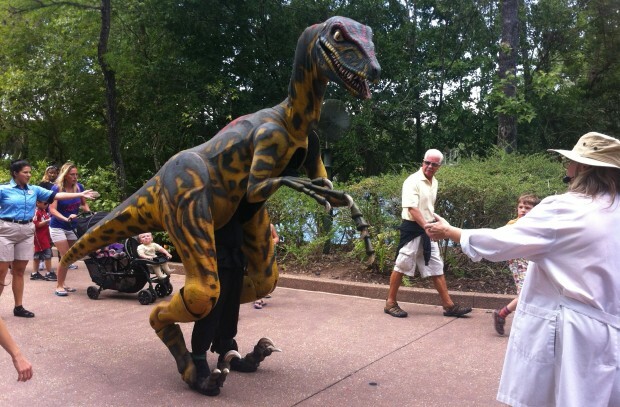 Because of that, the velociraptor is friendly toward guests and curious about them and the Dinoland environment. “Val” is constantly moving around the land and does not stop for photos with guests. If you’re walking behind her, watch out for the tail! 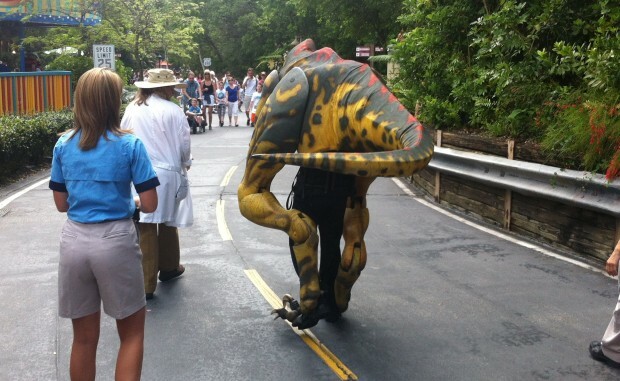 This test meet and greet and the future of “Val” will most likely be dependent on guest feedback. Set times are currently 11 a.m., 12, 2, 3, and 4 p.m. The costume is cool and all but…augh! People! We’ve known this animal was covered in feathers for well over a decade now! Pick a different dinosaur if you can’t do feathers! Maybe one that isn’t really half that while we’re at it. Make kids interested in dinosaurs as they were, not how they were in that one movie. Neat! She’s wearing a headset mic, and Val is shrieking… Where does the audio come from? Wow. This is just pretty sad. The fact that there’s a person under there is quite obvious; pretty much ruins the illusion right away. At the least they could alter the legs so it doesn’t look like one of the velvet bodysuit puppeteers from the Voyage of the Little Mermaid decided to carry a dinosaur carcass on his back and make roaring noises. And couldn’t they just bring Lucky back out? The costume isn’t designed to fool adults. Yes, but the fact that Disney already has an amazing animitronic dinosaur that fools adults and children alike, yet they come out with this thing, is kinda funny. I like the idea and it looks about 50% realistic… however, sure it is not intended to fool adults… .but even my 5 year old would have noticed the man/woman in the black clothes under neath. 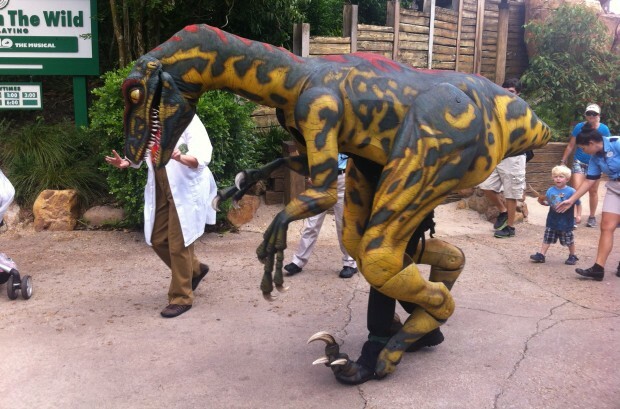 Alter the legs so that you cannot see the human underneath and change the colour of the clothing from black to a colour that is found on the dinnosaur. I like the idea, it is really cool for little people that love dinnosaurs, but you need a bit more to trick them than a man carrying a dinnosaur on his back. These kids nowadays are almost smatter than us adults. Not sure, but I have a theory – I *think* that could be a man in a suit?